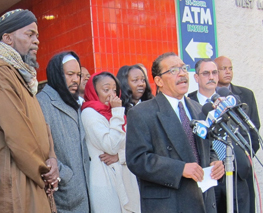 Los Angeles City Council President Herb Wesson has announced a $75,000 reward for information in the shooting death of 7 year old Taalib Pecantte and the attempted murder of his mother Sawan Mock. Wesson and the Los Angeles Police Department are asking for the public’s help in identifying and bringing to justice the perpetrators of this terrible crime. LAPD Detectives have been unable to identify any suspects or eye-witnesses to the crime and are seeking the public’s help. Anyone with information is urged to call the LAPD’s 24-hour toll-free number, (877) LAPD-24-7. Anonymous tips can be conveyed by calling Crime Stoppers at (800) 222-TIPS.